You are going to Watch Sword Art Online II Episode 21 English dubbed online free episodes with HQ / high quality. Stream Anime Sword Art Online II Episode 21 Online English dub Swordsman’s Memorial. While Kirito battles the raid party’s reinforcements, the Sleeping Knights engage the forces blocking the path to the boss room. However, seeing that their assault was useless due to the guild’s healers, Asuna asks Siune to manage the healing herself and uses Flashing Penetrator to break through to the healers while killing the group’s leader. After the healers are disposed of, followed by the rest of the players, Asuna and the others enter the boss room. During the boss battle, Asuna deduces the boss’s weak point and orders Yuuki to use a Sword Skill. 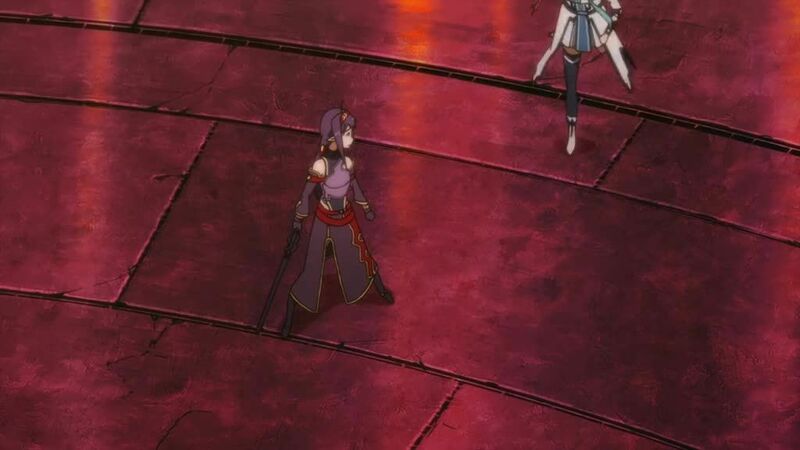 Following Asuna’s suggestion to use Tecchi as a stepping stone, Yuuki defeats the boss with her signature Original Sword Skill. With the mission concluded, the group agrees to celebrate at Asuna’s in-game home. While conversing about various things, Asuna asks whether she could join the Sleeping Knights and notices the unpleasant reactions of the others. The group then goes to the Monument of Swordsmen, where they take a picture. Afterwards, Yuuki accidentally addresses Asuna as her elder sister. Since Yuuki also did so back in the boss room, Asuna points this out to her and Yuuki unexpectedly starts crying and abruptly logs out. 4.8 / 5 - 93 ratings.